TopSpec Racing Feed Balancer is designed to promote ultimate performance in race horses and point-to-pointers. It provides nutritional support for optimum speed, stamina and recovery rates. It is ideal as a low-starch competition feed for horses needing specialist diets e.g. those that are prone to problems with muscle function. 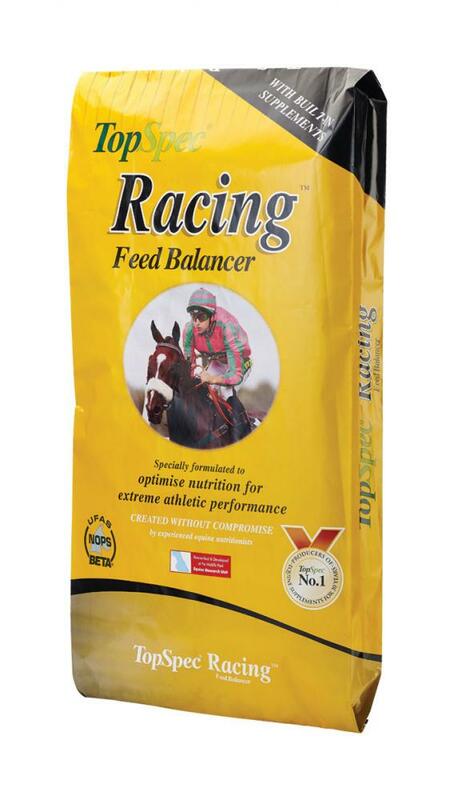 TopSpec Racing is fed at a rate of just 1 Kilogram per day for a 500kg horse, because it is highly concentrated it is fed at much lower rates than oat balancers, helping to maintain appetite and a healthy digestive tract. High quality protein, rich in essential amino acids such as lysine, plus vitamin E and selenium, vitamin A, calcium, magnesium and copper, which all work to promote superb muscle development and function. High quality protein, rich in essential amino acids plus optimum levels of calcium, phosphorous, vitamins A, C and D, magnesium, copper, zinc and manganese combine together to optimise bone development in young racehorses and strength in all ages. Very palatable and nutrient-dense; includes a pure, protected yeast and vitamin B12. These combine to help maintain appetite at peak fitness. Generous levels of B vitamins, phosphorus, magnesium plus vitamin A, C and E with selenium and manganese all help to promote efficient energy metabolism. Copper, zinc, vitamin B6, B12 and folic acid with a carefully balanced, but not excessive level of iron all provide nutritional support for red cell formulation. The level of Biotin, and the associated nutrients methionine and cysteine, calcium vitamin A, zinc, copper, iodine and intracellular soya oil, scientifically proven to improve hoof quality are included. This is 15mg/500kg horse/day. These nutrients also improve skin and coat quality. Generous levels of anti-oxidants, principally vitamins A, C, E and selenium combat the free radicals that are increased by stress; the pure, protected yeast and MOS offset the effects of stress on the gut. These combine to moderate the effect of stress, such as extensive time in a stable, later stages of training, travelling and racing. Rich in vitamins A, C, E and B6 plus MOS and Omega-3 fatty acids, which all help to maintain a healthy immune system. Because TopSpec Racing Feed Balancer is so highly specified, there is no need to feed the following supplements at the same time. There are currently no questions for Top Spec Racing Feed Balancer for Horses - be the first to ask one!